"Keeping things simple on Commercial Drive"
Located on Commercial Drive historically the domain of Italian coffee houses, Prado Cafe is keeping the street at the centre of the coffee map in Vancouver with a focus on a great cup of coffee. Cafe owner Sammy Piccolo is a four-time World Barista Championship finalist and along with his brothers helped build the Caffè Artigiano chain in Vancouver. The cafe is located on the ground floor of a heritage brick apartment block and blessed with huge windows opening onto spacious room dominated by white walls and natural woods. After selling Caffè Artigiano in 2006, the family kept ownership of the roastery side of the business, 49th Parallel Coffee Roasters, which is run by his two brothers. 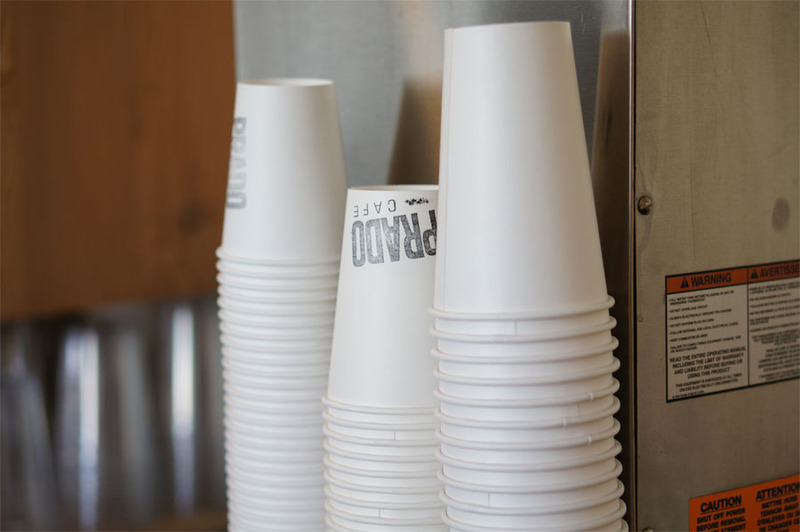 Prado Cafe of course uses coffee from 49th Parallel with a selection of drip coffee, pour over or espresso drinks prepared on their Kees van der Westen Mirage machine. While their passion for coffee is a given, Prado Cafe puts as much love into their baked goods with muffins, calzones and other baked goods freshly baked in the cafe. The cafe also recently added a brunch menu which is served until 2PM everyday that was created by Little Nest's Mary Macintyre. "As the image above shows, the building was designed with two storefronts on Commercial. The storefront at 1932 had a hard time finding tenants who lasted more than a year of so. Mrs. Flora Murray’s dry goods store was the first tenant but she was swiftly followed by electricians, a fish store, a meat market, several music stores, a couple of beauty parlors and an upholstery dealer. The storefront has not been used for retail since 1943." Sammy purchased the cafe from former JJ Bean alumnus Amy York who opened Prado Cafe in 2005. 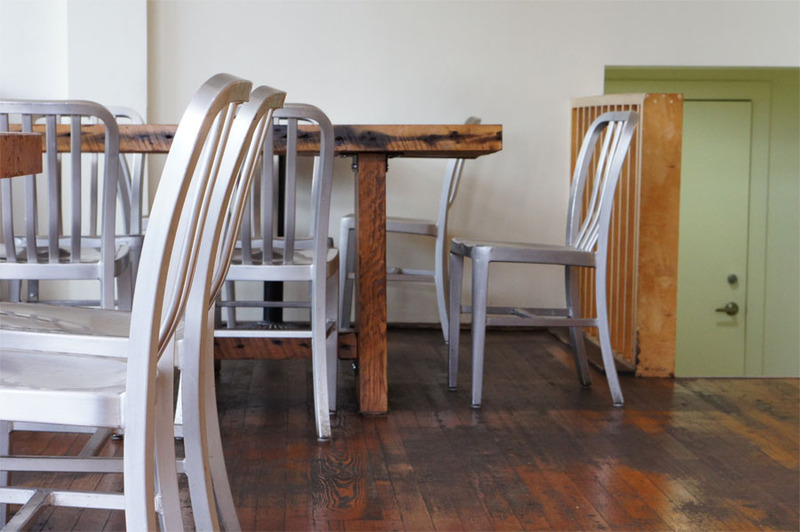 The interior of the cafe hasn't changed substantially since the cafe was first opened, but one change is the communal table brought is made with wood from a 100-year old heritage building. Re-opened by Sammy Piccolo on December 29, 2011. With the area known as "Little Italy" it's no surprise the area is credited with having the first espresso bar in Vancouver when the Tommaso Bresciani opened Cafe Italia in 1969. Along with launching several cafes, the Bresciani family later got into the espresso machine supply business which they continue to operate in Burnaby with ECM Espresso Coffee Machines. Corner of Commercial Drive and East 4th Avenue. "Sammy Piccolo, owner of Prado Café, makes the work of a topnotch barista look effortless. He confidently and seamlessly switches between making espressos, pouring drip coffee, mentoring staff, and chatting with customers as he slides their beverages across the counter."